Ideaplants.org is a blog and social networking service for the discussion of sustainable projects all over the world. A few days ago the Bosque was highlighted in the recent blog entry on creating a sustainable lifestyle based on permaculture principles. After many rainless months the clouds have rolled in and (in hopeful theory) the rainy season has begun! All the life here, from humans to plants, is finally getting what is needed. We’re so excited about the progress we’ve made this year. Tons of work has gone in to preparing plant beds, small seedlings, collections of seeds, and wheelbarrow loads of tierra de encino (composted oak leaves). All the work that volunteers and residents have been doing for the last three months is coming to fruition now that the rains have arrived. It is a bit earlier than the last two years, which is wonderful. Last year the rains did not arrive until the first week of June, and also went on hiatus for three weeks in July and August - which are normally the rainiest months. The rain pattern last year hurt a lot. We’re hoping this year the rain will be plentiful and the plants will be so happy! Since we were expecting the rains to arrive in June, we find ourselves in a mad planting rush, getting seeds into gardens and small plants into the ground. We’ll be planting until the beginning of July, when we’ll change our focus to tending the gardens and also building cob structures while we have the excess water from the rain to work with. One of the philosophies we have is a to limit human irrigation. Agriculture using irrigation is the source of much human conflict. We rely on the rains to water the plants from the end of May until late September - then, the plants are on their own. With the exception of very valuable plants that we really have a strong interest in keeping alive (though ideally we would like all our plants to stay alive), we do not water our plants and gardens in the dry season. Instead we focus most of our energy towards selecting plants that can live in this climate - nopales, magueys, succulents, and fruit trees - without relying on water to irrigate plants which are not suited for a climate with an extended dry season. This philosophy leads to the main criticism we receive of our permaculture project. Many of our extremely knowledgeable volunteers and visitors just do not comprehend how we can neglect the food gardens and focus more on our food forest: planting for years down the road rather than planting for the next few months. We’ve found that people want to see a year-round produce heavy garden providing vegetables, even when we’re in the midst of an extremely dry period of the year. While this is a lovely idea, we can only make this idea happen when we expand the rain catchment systems and build more extremely expensive cisterns to provide the water for a large produce garden. We have over 100,000 liters of cistern space right now, but even with this amount we do not have water to spare to keep a garden alive to provide year-round produce to our visitors. Of course, we will plant food this year in selected gardens in order to have our own supply of fresh garden veggies during the time of year when we have excess water to feed the plants. And we do intend to have a year-round tomato and greens patch. 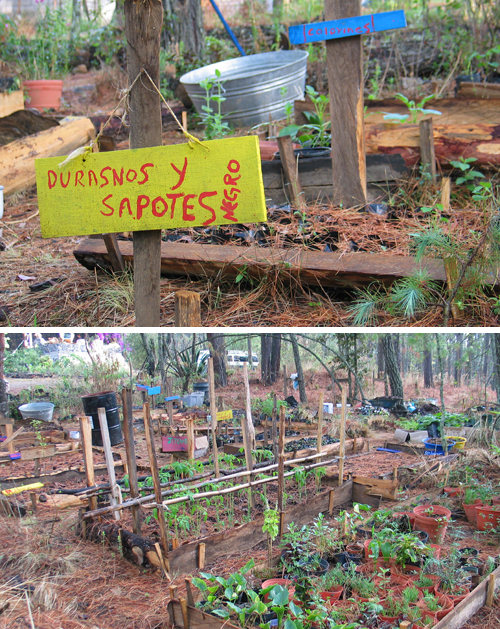 But what we’re really excited about is developing the forest to have a collection of food plants scattered about: avocados under the shade of some pines, walnut trees along the trails, nopales ready to pick nearly everywhere, and magueys to harvest for agave nectar. We’re planting plums, peaches, loquat, figs… and vine plants like chayote and passion fruit that do so well here and can cover fences and grow up trees. We are also planting “near natives” collected from microclimates nearby. We do this in hopes of speeding recovery if damaging rapid climate change occurs. For their asethic value, and the nectar they provide birds and bees, we’ve put in hundreds of jacaranda trees, cactuses, red hot pokers, and other beautiful flowers, succulents, and vines that do great in this climate. We’re restoring the native orchids, ephaphitic cactusus, ferns and bromiliads that were in the forest before it was clear-cut some 60 years ago. After today’s planting we will turn our efforts towards reproducing more plants for next year’s rainy season. June is our busiest month! Some volunteers cancelled due to fears about the Swine flu. 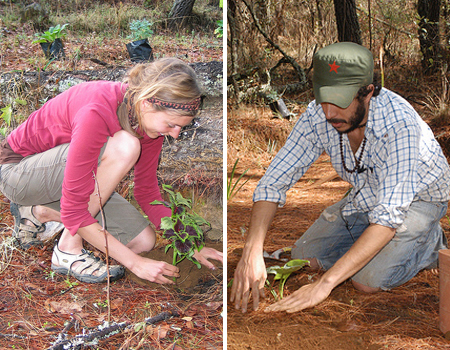 We have positions available for volunteers and WWOOFers who are interested in visiting Mexico and the Bosque, and working hard to help us create an ecological and social paradise. See our website for more information. We have a gazillion pine needles on the forest floor. For weaving baskets, the pine needles need to be long - at least 20 centimeters, or about 8 inches. A women’s collective in Opopeo (a village about an hour from the Bosque) came to this area and taught the women here how to weave beautiful pine needle baskets. Socorro is now very talented - she makes baskets to sell in the market and for visitors here - most recently a tortilla warmer for one of our volunteer’s mothers for Mother’s day. She also teaches a 3 hour workshop on pine needle basket weaving. 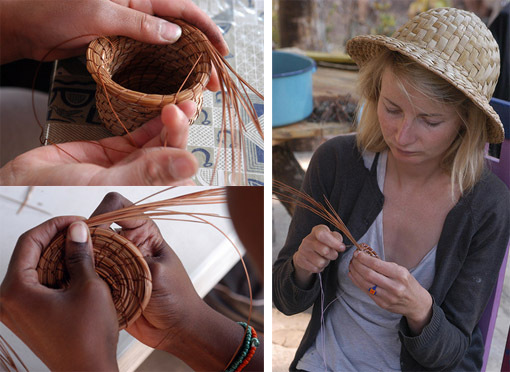 During the workshop students learn how to start the basket, finish the basket, and of course, weave the basket. Students take their baskets home, and also have the opportunity to work on additional baskets in a more advanced class setting. The art of pine needle basketry has been practiced by indigenous groups on Turtle Island for over 9,000 years. In this area, working with pine needles, or huinumo, is quite popular. In the United States, some craft shops sell the long pine needles in areas where the trees don’t grow. You can even buy them on ebay. The hat Melissa is wearing in the photo above is made out of another popular material used for weaving called chuspata - a lake reed. Chuspata is so widely known and popular around here it was even the original name for Honey Cupcake! The floor mats at the Bosque are all made using chuspata, and we plan to be able to offer a class for making mats, tortilla warmers, and hats out of chuspata in the future. Below is the group after taking a huinumo class last week. huinumo: pine needles Huinumo is actually a word in Purépecha, not Spanish. Purépecha is the indigenous language in this area. jale duro: pull it hard! We now have a Spanish language teacher offering Spanish lessons and language exchange for visitors and volunteers who want to improve their language skills while staying here in the forest. Raúl is originally from Mexico City, and will be living at the Bosque until at least August. He has been teaching for years, and has been offering lessons to many of his friends and acquaintances who want to become better at Spanish speaking, comprehension, and writing. He has a legal background and can teach legal Spanish as well. 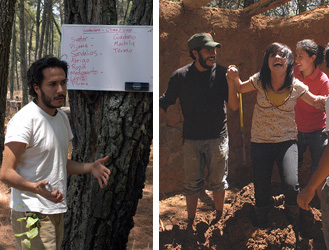 Raúl is multi talented - he also holds discussions on permaculture, vegetarianism, and leads workshops on natural building. I came to the Bosque with many years of experience studying Spanish grammar but without the ability to hold a steady, fluid conversation. After a two week stay with language lessons from Raul, I left the Bosque and continued my travels in Mexico, confidently conversing in Spanish. This is the best I have ever felt about my language skills, and my lessons with Raul took me to a whole new ability and confidence level. The lessons were fun, effective, and there couldn’t be a more beautiful setting for them. I seriously recommend the Bosque and Raul to anyone for Spanish studies, regardless of skill level, and I met several other guests during my stay who feel the same. 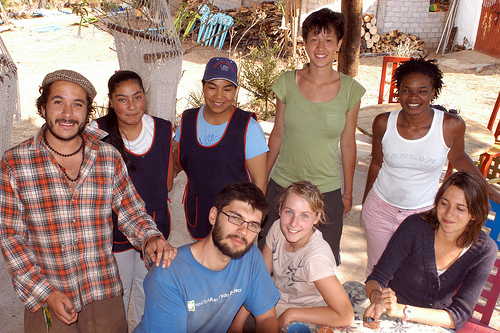 friends in nearby villages who offer language exchange. Visitors to the Bosque speak a number of different languages. 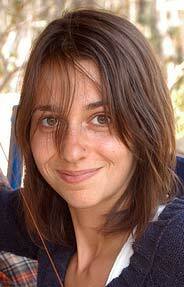 Generally we have a wide variety of Spanish skill level here; beginner, intermediate, advanced and native speakers. For both Spanish and English students who want to practice, we encourage speaking in your second language when possible. If the person you are speaking to looks back at you with confusion, switch languages! For people who would enjoy a rural setting, this could be the best place to study Spanish in Mexico. Another Spanish teacher will be joining us in late July. We are recruiting TEFL certified English teachers to offer their classes here as well. With a mix of English and Spanish students here, language exchange will happen naturally and visitors here will have a very language enriched experience. Perhaps in the future we will also be able to offer classes in basic Purépecha, the language of the indigenous group in this area. For more information about Raúl’s Spanish classes, click here. For more information about Bosque language resources, click here. You are currently browsing the News and thoughts from the Bosque Village weblog archives for May, 2009. Entries (RSS) and Comments (RSS). 18 queries. 0.162 seconds.